Years of hard work recognized as Robert Koehler & Jerry Jessick receive their promotion to Lieutenant Colonel! After 10+ years of hard work and dedication to the Civil Air Patrol missions, Fox Cities Composite Squadron is pleased to be able to congratulation Lieutenant Colonel Robert Koehler & Lieutenant Colonel Jerry Jessick on their recent promotions! The promotion to Lieutenant Colonel is the culmination of the senior member program as it is the last attainable grade within the program. To reach this level a member must complete all five levels of the professional development program; as well as serving within the program at various levels for approximately 10 years. Reaching this level is not just a given, it is something that is earned with hard work and dedication. Fox Cities Composite Squadron is proud that these gentlemen have dedicated their time to make our Squadron and our Wing the best it can be! As summer ends the continuing changes at Fox Cities Composite Squadron are becoming more exciting! On Tuesday, September 13, 2017, First Lieutenant James Lange took over as the new Squadron Commander. The Change of Command Ceremony was well attended as parents, family, and friends joined us the welcome Lt. Lange into his new positon. Major Mark Niemi relinquishing command. First Lieutenant James Lange accepting command. Fox Cities Composite Squadron would like to thank Major Niemi for his dedication and leadership! Maj. Niemi will be staying with Fox Cities as the Operations Officer for the Squadron. This will allow him to dedicate his time to aircraft operations and helping to prepare our pilots to serve in Emergency Services missions and training. Fox Cities Composite Squadron is looking forward to continuing our growth and excellence as a Squadron under the leadership of Lt. Lange! Fox Cities has seen our fair share of graduating high school seniors move on this year! We wished Cadet Staff Sergeant Jack Gossen farewell as he started his career with the United States Merchant Marine Academy and Cadet Second Lieutenant Michael Chanda as he starts his career with the United States Air Force. There is another graduating senior at Fox Cities Composite Squadron, who is not leaving us just yet. Cadet Second Lieutenant (C/2d Lt) Lauren Vassios, graduated from Menomonie High School in Menomonie, WI, June 2016. Lt. Vassios spent some time with the Eau Claire Composite Squadron, just recently transferring to Fox Cities Composite Squadron. She has been an amazing addition to our team, as one of few female Cadets in our Squadron she has blended in seamlessly and has been a great resource and role-model for our younger Cadets. Lt. Vassios will be staying in the area attending UW-Fox Valley to complete her core classes before auditioning at UW-Milwaukee to pursue her Bachelor of Fine Arts degree in Musical Theatre with the intent of continuing her musical career on Broadway! Congratulations Lt. Vassios, we look forward to continuing to work with you at the Squadron while you finish classes close to home, and wish you luck on your future endeavors! Summer always brings change to a squadron, we get busy with training events and family vacations sometimes limit our numbers. This summer we have seen a different change; through the first 2 months of summer we have seen our Squadron grow with new members. 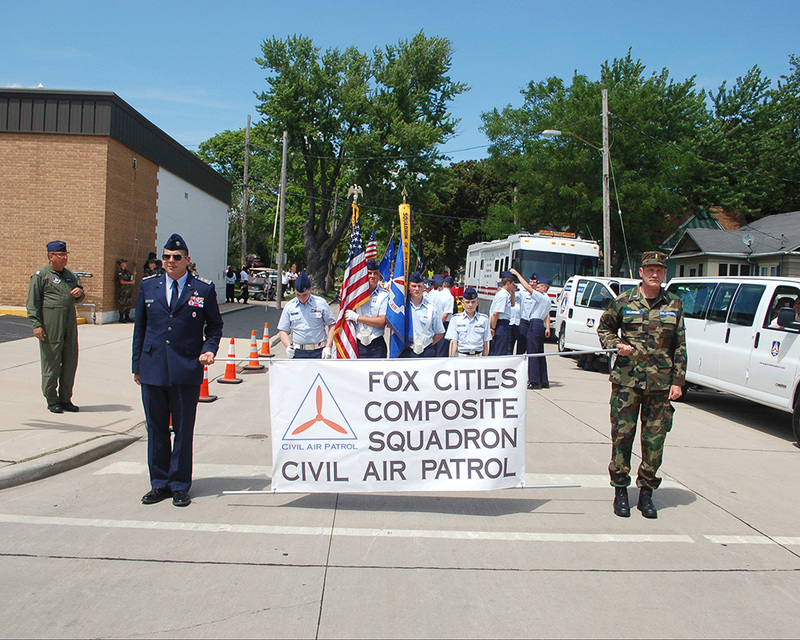 Welcome to all of our new members, this is a great time to be part of the Fox Cities Composite Squadron! Along with Squadron training events increasing in these warm months, National Cadet Special Activities (NCSA’s) explode in excitement this time of year. There have been many NCSA’s that have taken place already this summer; National Flight Academy held in Oshkosh was attended by Cadet Chief Master Sergeant (C/CMSgt) Jessick. C/CMSgt Jessick was able to pre-solo, which only leaves a few more required hours for him to receive his private pilot license. Model Aircraft & Remote Control Flight Academy also took place in Oshkosh in June, and was attended by C/CMSgt Niemi and during AirVenture (EAA) in July National Blue Beret will be attended by C/Second Lieutenant Vassios. To be able to attend any NCSA each Cadet must complete a Wing Encampment. June 25-July 2, Wisconsin Wing held Encampment at Volk Field Air National Guard Base. Cadets at various levels met from across the state with a common interest … learning leadership and teamwork, and having some fun along the way! Cadet Technical Sergeant Voelker, Cadet Master Sergeant Vassios, and Cadet Technical Sergeant Steeneporte attended the Cadet Development Course at Encampment. While Cadet Technical Sergeant Bastian, Cadet Senior Airman Peroutka, Cadet Airman First Class Peroutka, Cadet Airman First Class Laudolff, Cadet Airman White, Cadet Airman Schlaeger, Cadet Senior Airman Jerred, and Cadet Senior Airman Coulombe attended their first level of Encampment, Wisconsin Basic School. Their dedication and desire to excel within Civil Air Patrol is evident. If you are interested in learning more about the Cadet Special Activities that are offered throughout the U.S., please visit: www.ncsas.com. There is also a Flickr account that shows the excitement of Encampment, if you are interested in seeing some of the “behind the scenes” fun, check out: www.flickr.com/photos/wiwgcap. As mentioned in our previous blog post, summer also brings changes to a squadron in terms of graduating Cadets. Fox Cities Composite Squadron is currently preparing to bid farewell to another of our Cadet Staff members as former Cadet Commander, Cadet Second Lieutenant Michael Chanda begins his career in the United States Air Force. C/2d Lt. Chanda will be leaving the end of July for 7 weeks of basic military training at Lackland Air Force Base in San Antonio, TX. Upon completion of basic training, C/2d Lt. Chanda will be headed to Keesler Air Force Base in Biloxi, MS for 72 days of advanced training to begin his military career as an Air Traffic Controller. In preparation for C/2d Lt. Chanda’s departure FCCS held a Cadet Change of Command Ceremony on, 5 July 2016. Cadet 2d Lieutenant Michael Chanda passed on Command to his younger brother, Cadet 2d Lieutenant Jacob Chanda. 2d Lt J. Chanda has been with CAP for 4 years and has attended various training events in order to grow his leadership skills. While we look forward to C/2d Lt Jacob Chanda’s leadership within our squadron, we will all miss Lt. Michael Chanda’s willingness to help and infectious smile. Please help me in wishing Michael Chanda well on his new adventure … Godspeed Lt. Michael Chanda and we look forward to an occasional visit when you find yourself back this way! June has already escaped us; with only six days left we will have found July already. Our Squadron has been busy with Parades, training, new Cadets, and Encampment. 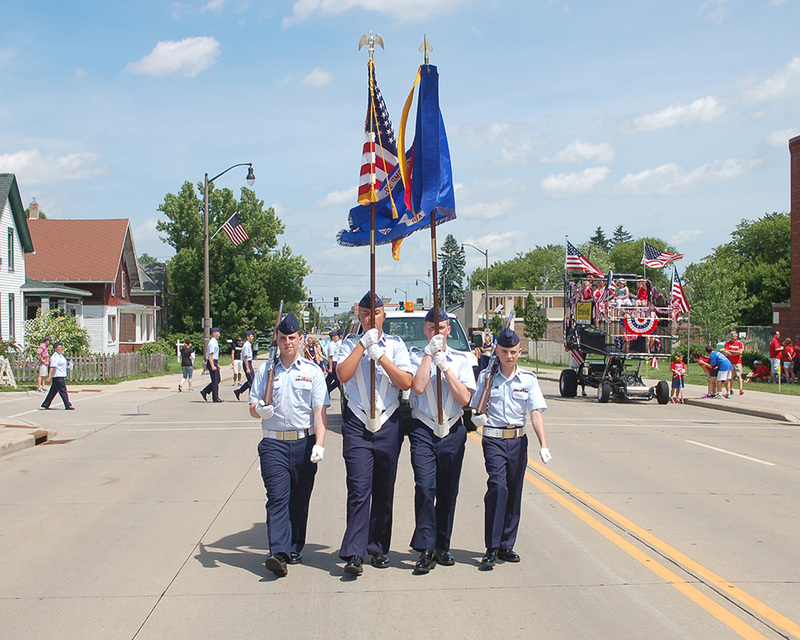 11 June, Fox Cities along with Brown County Senior Squadron and Door County Composite Squadron marched in the Appleton Flag Day Parade. It was hot, but we stood proud, looked great, and had an excellent time. Following the parade members were able to have some down time and enjoy a picnic in the park with games, great food, and even better company. We have had a few Cadets participating in National Cadet Special Activities; National Flight Academy in Oshkosh, Model Aircraft & Remote Control Flight Academy also in Oshkosh, and this week Cadets are attending Wisconsin Wing Encampment. Cadets will take part in a week long training; learning leadership skills, drill and ceremony, and meeting new friends from all over the State! Summer also brings High-School Graduations, which mean change within every Squadron. Last Tuesday, we had to bid farewell to Cadet Staff Sergeant Gossen as he prepares to leave for an appointment with the U.S. Merchant Marine Academy in Kings Point, NY. Gossen has been with our Squadron for roughly two years and we will greatly miss his positive attitude. God Speed Gossen and we look forward to seeing you soon! Fox Cities Composite Squadron (FCCS) is excited to announce that Cadet Second Lieutenant (C/2d Lt) Michael Chanda has earned the Captain Thomas J. Hudner, USN Retired, Scholarship of Honor, sponsored by the Brian LaViolette Scholarship Foundation. Cadet Second Lieutenant Chanda has actively been a member of Fox Cities Composite Squadron for 4 1/2 years. In that time he has excelled, showing great leadership and dedication to the Civil Air Patrol mission. C/2d Lt Chanda has served within various positions at our Squadron including; Cadre for Basic Cadet Training, Cadet First Sergeant, Cadet Deputy Commander, and he currently serves as the Cadet Commander. His commitment to Civil Air Patrol also extends outside of our Squadron level; he has attended 4 encampments at Volk Field Air National Guard Base, the Advanced Technology Academy at Peterson Air Force Base, Colorado; and Powered Flight Academy in Oshkosh where he earned his solo wings. Cadet Chanda also previously served as the Fox Cities Composite Squadron’s representative to the Wisconsin Wing Cadet Advisory Council. He was named the 2015 C/Lt Col Christopher R. Koehler Leadership Award recipient for FCCS. Michael has further served on staff at the Non-commissioned Officer School run by our squadron, sharing his knowledge with cadets across the Wing. C/2d Lt Chanda enlisted in the U.S. Air Force and is scheduled to report to Basic Military Training in July. He will then attend AF Technical School at Keesler AFB, Mississippi for a 72 week Air Traffic Control course. Please take a minute to Congratulate C/2d Lt Michael Chanda; FCCS is proud of your accomplishments and your drive and dedication to serving our country. Well done C/2d Lt Chanda! FCCS is excited to welcome quite a few prospective families to our meetings lately, we are hoping to be able to add a whole list of new members to our next newsletter! We also have quite a few upcoming events, First Aid Training, Professional Development Weekend, our Spring Field Training Exercise, Memorial Day Parade, and the Appleton Flag Day Parade just to name a few! We have a busy and exciting summer ahead of us so please check back often for pictures, blog posts, and fun!! FCCS is very excited to welcome a new aircraft to our squadron, a brand-new-from-the–factory Cessna 182T Skylane! Thanks to our very active squadron, especially Mission Pilots, Mission Observers, and Mission Scanners, Fox Cities Composite Squadron was chosen to receive Wisconsin Wing’s newest aircraft, which is equipped with the Garmin G100 glass cockpit with integrated GFC700 autopilot, Becker direction finder, and CAP FM radio. This aircraft will be used to support our emergency services mission, train with USAF aircraft, and fly cadet orientation flights. In preparing for our next quarterly newsletter, Major Jerry Jessick wrote a great article on Character Development and how Civil Air Patrol plays into our growing teens. I have been contemplating FCCS’ next blog post for awhile now and I don’t think there is a better post than his article! Just for fun, open the Google window on your computer or handheld device and write principles of youth leadership development in the search box. Of course, people have put a lot of time into figuring out what it takes to teach our kids how to be good followers, and leaders, or both. No matter which article you open from the list of Google responses, I think you’ll agree that Civil Air Patrol’s cadet program is an excellent forum for connecting our kids to positive character-building experiences. But the Civil Air Patrol cadet program is nothing more than words on paper, until it is put into action by parents, cadets, officers and volunteers like you and me. When our sons and daughters participate in Civil Air Patrol squadron meetings and other events, they experience things first-hand that are almost impossible to tell them about at the dinner table. But experience is just the first step. Having experienced something challenging or fun or awesome, cadets are then able to share the experience by describing it to you (if you weren’t one of the senior member officers who was there). And while sharing their highly valuable experiences, our cadets make the experience part of themselves and their real-life character. This is character development! Where else can your daughter or son find safety, structure, belonging, membership, self-worth, responsibility, self-awareness, social skill building, and meaningful roles that are all supported by proven core values (excellence, respect, integrity, & community service)? 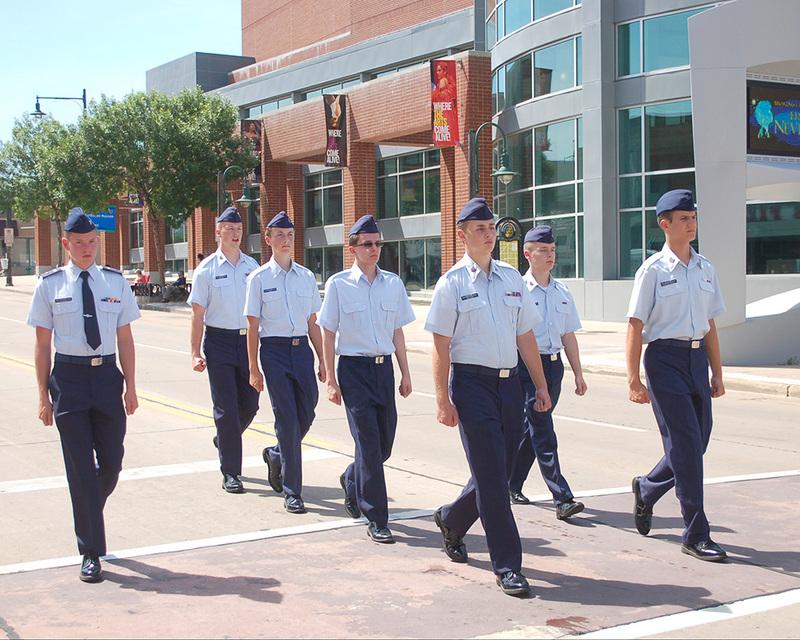 The character development value of our Civil Air Patrol programs is absolutely enormous. But it is also time sensitive; the opportunities do not last forever. Let’s have a sense of urgency, and recognize the importance of character development within the Civil Air Patrol, by participating in all that we can. Time does not stand still. Our twelve year-olds will be eighteen-plus before we know it. Saturday, the 5th of March, FCCS celebrated last years achievements with our Annual Awards Banquet! As promised the food was great, camaraderie was strong and fun was had by all! Fox Cities Squadron would like to thank our guest speaker, Sean Elliott (Vice President of Safety & Advocacy at EAA) for an exciting presentation and look into the history of EAA! We look forward to sharing more events with Mr. Elliott & the EAA in the future! We would also like to thank those who traveled to be with us; Col. Rose Hunt (WI Wing Commander), and Lt Col Patrick Gaylord (NE Group Commander); as well as all the family and friends who support our Civil Air Patrol missions everyday. The annual Awards Banquet is to honor those within our Squadron who have selflessly given their time and energy to our great cause as well as to thank those who support them! Thank you to our Color Guard team (pictured front to back): C/CMSgt Franklin, C/2nd Lt J. Chanda, C/CMSgt Niemi, C/SSgt Gossen for starting our evening! A well trained color guard signifies a sense of teamwork, confidence, pride, alertness, attention to detail, esprit de corps and discipline. Job well done! Of course we have to get to the Congratulations! Our night was not only full of food and good friends, we also recognized those members who have given CAP a little extra. We appreciate all those who dedicate their time and energy to our Squadron as we couldn’t do it without each and every one of you! Not only are we able to celebrate these amazing accomplishments, this year we are celebrating the 75th Anniversary of Civil Air Patrol! December 1, 1941, CAP was congressionally chartered as the Official Auxiliary to the US Air Force. Want to learn more? Check out this CAP Video! and be sure to watch for Upcoming Events to help us Celebrate!